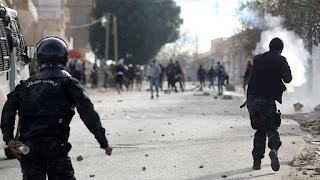 Protests has erupted in Tunisia after the death of a journalist who set himself on fire to protest against economic hardship in the North African nation, prompting clashes with police. "For the sons of Kasserine who have no means of subsistence, today I start a revolution. I am going to set myself on fire," Zorgui said in the video published before his death. In late 2010, a similar self-immolation by Mohamed Bouazizi, a street vendor lamenting unemployment, corruption and repression, led to nationwide protests fueled by social media that brought down Tunisia's long-time authoritarian President Zine El Abidine Ben Ali in 2011. That ushered in democracy for Tunisia and unleashed similar movements around the Arab world. Zorgui's funeral was held on Tuesday in Kasserine, which has come to symbolise Tunisia's economic problems and social tensions. The Tunisian National Journalists' Union called for demonstrations and a possible strike in response to the journalist's death. In a statement, it accused the state of contributing to Zorgui's death by not cracking down on corruption. The union said he died protesting "difficult social conditions…and lack of hope," Tunisian reporters expressed solidarity with Zorgui, lamenting precarious conditions for freelancers with no legal protections and low pay amid Tunisia's struggling economy. "The reasons for this young man's suicide are poverty and marginalisation, as well as the fragile situation of most journalists," said Latifa Labiadh of radio station Amal. Despite the country's democratic transition after Ben Ali's removal and a recent return to economic growth, authorities are still struggling to improve poor living conditions.